You should make your reservations as soon as you know your dates of travel. Prime dates sell out quickly so early booking is recommended!If you are in the United States, please call 800-580-3494 to speak to one of our Tour Coordinators. When and how should I arrive in Alaska, are there transfers? As you will be buying your flights independently, you’ll be responsible for arriving on time for all of your travel components. Allow extra time for each leg of your travel itinerary to help ensure that you don’t miss the tour or your flight home.This tour begins and ends in Anchorage. Gratuities: In addition to standard tipping practices (ex: waiters and waitresses, housekeeping staff, taxi/shuttle drivers, and baggage handlers). Tipping others who provide personalized services is common in Alaska. Drivers who offer a particularly informative trip generally receive a tip from passengers at the end of the tour. Industry standard is $15 per person, per day. 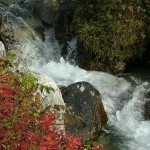 Fishing & rafting guides are commonly tipped by their clients. Gratuities may also be given to pilots following a particularly good flightseeing or bear-viewing trip. Tips are appreciated, never expected; use your discretion.Upgrades: Any additional activities, tours or hotel nights are not included in the tour package price. Is my rental car included in the tour package price? No, your rental vehicle is not included in your tour package price. We can assist with reservations or you can make your own reservations. How much does gas cost in Alaska? Gas can cost anywhere between $3.99 to $5.99 a gallon. 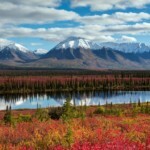 The 2012 summer season saw a high of $5.19 per gallon in Denali National Park. • We suggest bringing an average of $40 – $60 a day pp for food on your tour. The biggest factor to consider is Alaska’s weather, of course. But activities at sea and ashore may also require some special packing. Dressing in layers is the way to go when you’re exploring the Alaskan wilderness. Pack some short-sleeved shirts (though it’s doubtful you’ll have much need for more than one pair of shorts), sweaters, and sturdy, comfortable light hiking boots or rubber-soled walking shoes. A polar fleece vest or jacket along with a wind/rain coat will round out the layering effect. We supply ear bands, gloves and umbrellas in each vehicle, however, you may want to bring them if you prefer your own.The following checklist includes some additional suggestions to help you get started – it’s by no means comprehensive, but it’s a good place to begin. Yes. We have limited ability to manipulate your itinerary. We can book anything in the state of Alaska! 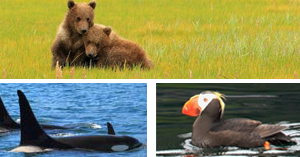 From a remote Lodge experience to an Inside Passage Cruise, call one of our Tour Coordinators for details! Passports are “required” for all cruise passengers.